Intersys joined 7 highly respected companies in New York to accept awards from Business Insurance, who recognised SCAIR, our ‘Supply Chain Analysis of Interruption Risks’ software as bringing innovation to the insurance industry. SCAIR is used by insurers to help transparently determine Value At Risk for Business Interruption insurance for manufacturing clients. The awards were decided by an independent panel of Risk Management professionals. Catherine Geyman accepted the award for Intersys and was joined on stage by Neil Campbell of Jardine Lloyd Thompson. If you’re a Risk Manager, Supply Chain Professional or just someone concerned with the health of your manufacturing functions, how can you be sure you have fully considered your supply chain vulnerabilities? Our software, SCAIR: Supply Chain Analysis of Interruption Risks, helps you fully analyse the risks to your business, and ensured you have considered mitigating correctly against profit variations caused by Supply Chain Interruptions. Click here for a walk through demonstration of the software. For more information, call Catherine Geyman on 0845 094 8925 or contact us online. Supply Chain backup plans, weak links and Acts Of God. It pays to have supply chain backup plans, providing you know what to back up. 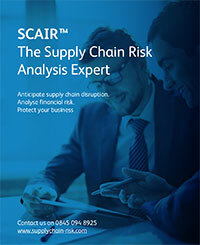 SCAIR® helps you improve supply chain risk decision making. The outputs from SCAIR® enable you to quantify the impact of critical supply point failure on your bottom line, helping formulation of appropriate continuity plans and increased levels of preparedness should the unthinkable happen. Having a weak link in your supply chain isn’t a problem. If you know where it lies. SCAIR® makes supply chain exposures – and their remedies – obvious. Failure to fully understand the vulnerabilities in your supply chain could result in damaging business interruption. This can be avoided by holding strategic inventory or evaluating alternatives. SCAIR® enables a cost benefit analysis of the value of investing in contingency plans against the value at risk. SCAIR® helps you keep your supply chains running. In an increasingly dynamic, global business environment, maintaining continuity of supply is the key. Understanding the value at risk at each point in your supply chain will enable you to focus on your critical vulnerabilities. SCAIR® guides you through a detailed analysis of your exposures and calculates the impact of single supply point failures across your product portfolio.